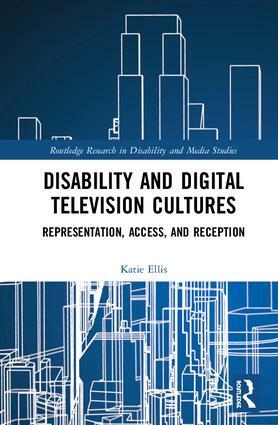 Disability and Digital Television Cultures offers an important addition to scholarly studies at the intersection of disability and media, examining disability in the context of digital television access, representation and reception. Television, as a central medium of communication, has marginalized people with disability through both representation on screen and the lack of accessibility to this medium. With accessibility options becoming available as television is switched to digital transmissions, audience research into television representations must include a corresponding consideration of access. This book provides a comprehensive and critical study of the way people with disability access and watch digital TV. International case studies and media reports are complimented by findings of a user-focused study into accessibility and representation captured during the Australian digital television switchover in 2013-2014. This book will provide a reliable, independent guide to fundamental shifts in media access while also offering insight from the disability community. It will be essential reading for researchers working on disability and media, as well as television, communications and culture; upper-level undergraduate and postgraduate students in cultural studies;　along with general readers with an interest in disability and digital culture. Associate Professor Katie Ellis is Senior Research Fellow in Internet Studies, convener of the Curtin University Critical Disability Research Network and Deputy Director of the Centre for Culture and Technology at Curtin University. Her research explores the social and cultural dimensions of disability, television, and digital and networked media, extending across both issues of representation and active possibilities for social inclusion. She has authored and edited ten books and numerous articles on the topic, and is series editor of Routledge Research in Disability and Media Studies. Her most recent books include The Routledge Companion to Disability and Media with Gerard Goggin and Beth Haller, and Manifestos for the Future of Critical Disability Studies with Rosemarie Garland Thomson, Mike Kent and Rachel Robertson. Dedicated to a media engagement with disability, this series fosters critical, contextual analyses and cross-disciplinary examinations of disability from a media studies perspective. From mass media representations to the in/accessibility of digital media technologies, online spaces and adaptive devices, media is fundamentally significant to the experience of disability. Without being aligned to a specific theoretical or methodological approach, Routledge Research in Disability and Media Studies publishes monographs and edited collections that promote dialogues on central subjects, such as texts and meaning, the production of media texts, media audiences, digital media influences and media histories as well as the intersections between these different lines of enquiry in complimentary areas such as anthropology, design, performance studies, science and technology studies, music, and media advocacy/activism.